Sometimes I am really surprised how few pieces of accessories can make quite boring outfit much more interesting. This is what I like to wear for grocery shopping/picking up box on post/going to laundry/handing out some documents at uni/ or anything else where you want to feel comfortable, not overdressed but still good looking. Few peaces of clothes I can just throw on and go. It is just kind of boring, no? Doesn't it look much better with tucked top, bold belt and matching scarf? As you might notice, I love scarfs as they help to pull the outfit together. Or spice it up. And what is your trick? the same? Bag which "makes the statement"? Massive necklace? Hair accessories? I would welcome some pictures! 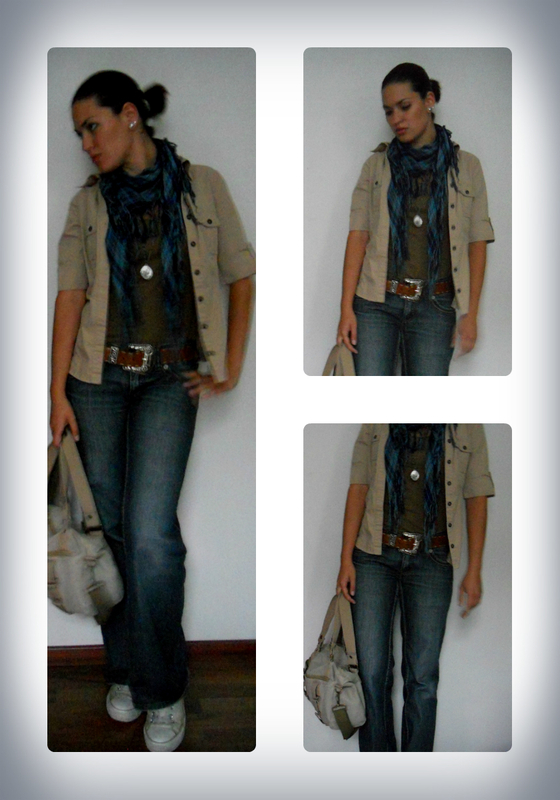 I am wearing Time out jeans, no name top, Cache-cache shirt, quite old Kenvelo belt (I have it since I was about 12), Converse shoes, no name bag (present), Daichman scarf and necklace bought in Veritas .